All of the brouhaha over Confederate statues has rekindled my interest in the Civil War, so I decided to work my way through some of the books that have been cluttering my shelves. 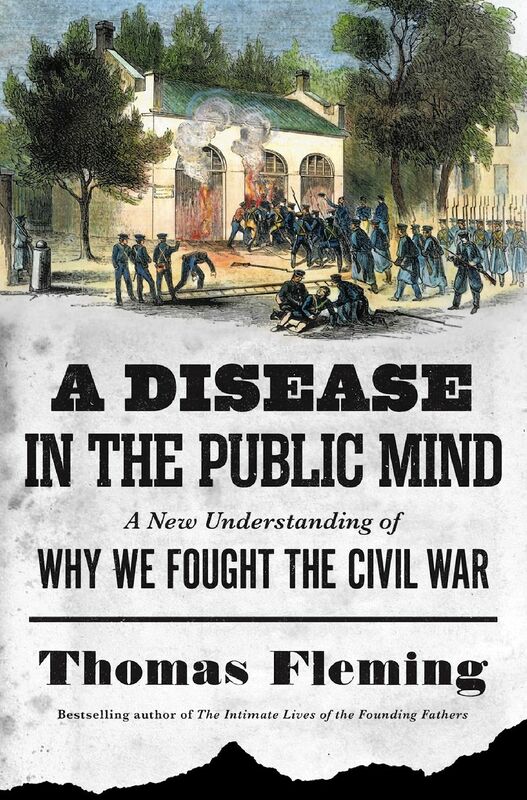 The first one is this volume by Thomas Fleming on the intellectual origins of the War Between The States. Actually, “intellectual origins” sounds too highfalutin. It’s more like a chronicle of the propagandistic origins of the war. Fleming traces the history of thinking about slavery and abolitionism in the United States from the colonial era until the surrender at Appomattox. Seeded throughout are vivid profiles of key actors like John Quincy Adams, John Brown, William Lloyd Garrison, Theodore Weld, and Harriet Beecher Stowe. In Fleming’s view, the war resulted from a clash of two great narratives: the Northern fear of the Southern “Slave Power” versus the Southern fear of slave insurrection or, to put it bluntly, race war. Both narratives were based in fact yet each side allowed its reason to be overwhelmed by emotion. In the South, the great fear was emancipation would lead to the kind of race war that ensued in Saint Domingue (Haiti) after the slave revolt led by François Dominique Toussaint-Louverture and Jean-Jacques Dessalines. While Toussaint-Louverture was a moderate, Dessalines was a radical who slaughtered as many white French as he could. Jefferson, who previously supported the gradual emancipation of slaves, switched to supporting the continuation of slavery out of fear that similar race war would erupt in the United States. His resistance to abolitionism would color Southern attitudes for generations, even if many Southerners admitted that slavery was an evil institution. He did not analyze and refute his opponents’ arguments; he denounced them, sneered at them, dismissed them. He found no conflict between this style and his religious beliefs because they both nicely complemented the prevailing attitude of New England Federalists. They were inclined to believe in the moral depravity of anyone who disagreed with them. This attitude was deeply rooted in the New England soul, thanks to the sermons they and their ancestors had heard for the previous century. A Puritan preacher’s favorite rhetorical form was the “jeremiad,” a shorthand term for style and content inspired by the biblical prophet Jeremiah. Jeremiads combined lamentation and condemnation of the spiritual and moral shortcomings of a people for their sinfulness and selfishness. Only a handful of mankind, stained by Adam’s primary sin, would ever merit salvation. A common propagandistic, er, journalistic technique in the 19th century press was lying, er, embellishing the truth. For example, the New York Tribune, a leading abolitionist newspaper, reported that John Brown, on his way to the gallows, kissed a black child as a sign of his deep, Christ-like affection for black people. Lithographs of the incident became popular, one of which was published by Currier & Ives. The Quaker poet John Greenleaf Whittier immortalized it in verse. Too bad it was a complete fabrication that never happened. Thankfully, this sort of fake news from the mainstream press, along with all-or-nothing fanaticism from the North, are relics of a less enlightened age that we contemporary Americans need not worry our pretty little heads about. Fleming talks about his book in a short radio interview. Here he reads from his book and then follows it up with a Q&A from the audience. Sad to hear that Fleming died last month. This entry was posted in Books Publishing and Writing, History, Politics and Economics and tagged Civil War, Confederate statues, fake news, John Brown. Bookmark the permalink. I get your point and I’m all for a more nuanced understanding of the Civil War, but using Northern abolitionists utter disdain for and unwillingness to compromise on SLAVERY as an analogy for today’s hard left’s obstinance is silly, at best. My point is an all-or-nothing attitude can wreak a lot of havoc. Did 600k people (some estimates say as much as 1m) really need to die? Even when dealing with an obvious evil like slavery, is there no room for compromise or gradual change? Other countries ended slavery with little or no bloodshed, so why do we assume a war had to happen here? It would have been nice if slavery could have been abolished without bloodshed, no question. But the power structure in the South benefitted from slavery, the Southern economy was heavily dependent on slavery, and racial attitudes at the time did not cause most regular people to advocate against slavery, especially the poorer whites, who at least were OFFICIALLY a higher status than slaves. I mean come on, we can’t even get wealthy people to pay a reasonable tax rate today, let alone give up the foundation of their wealth. And again, we’re talking about owning human beings as property. I don’t know man, seems an urgent cause to do away with a categorically horrible and entrenched institution, WAY more urgent a civil liberties cause than any today, and look at how volatile politics is today. The Southern economy was indeed dependent upon slavery, but the world economy was changing. Fleming points out that the British were setting up farms in India and Egypt that would eventually lead to a worldwide drop in cotton prices. Slavery would’ve become too expensive to maintain. Many Southerners were fully aware that slavery was an odious institution that had to go. But they knew that once black people were free, they — the South — would be the ones who had to deal with the newly freedmen, not the North. Many Northerners call for immediate abolition even though they believed that whites and blacks couldn’t live together and were unwilling to take in a huge influx of black people into their cities. In this, they were like the British addressing slavery in the West Indies. It was far easier for the British to abolish it when the fallout would happen thousands of miles away. Obviously, these are huge, contentious issues that we aren’t going to settle today. But I appreciated the book if only b/c, like you said, it provided a more nuanced view of why the war broke out. The idea that the North was completely on the side of the angels is kiddie stuff that should be left to elementary school classrooms. Their easy self-righteousness and propaganda arguably made a terrible situation worse than it had to be. And hell, look at the Civil Rights movement of the 50s and 60s. Blacks were no longer slaves but it took a heavy National Guard presence just to allow a little black girl to go to school. And in the same decade, JV, it took a heavy National Guard presence to restore order in Detroit when the little black boys there rebelled. And destroyed vast tracts of the city. “Little black girls” are photogenic. But they got brothers. Are we playing whataboutism? I thought we were discussing whether the abolitionist = current left analogy was valid or not. The fact that the south wasn’t gonna give up slavery, that the National Guard was needed to allow black people equal rights in some places, and that the Detroit riots were perpetrated by black people all can be true. The Southern states – which included Maryland and Delaware at this point – had an interest in reducing, in relative population, the local black population. Unfortunately this wasn’t going to happen on account of Virginia basically breeding their own blacks (which weren’t profitable at hone anymore) to sell down river. Also on account of wealthy Deep South plantation-owners casting covetous eyes abroad. Texas being the first conquest. Cuba and other Caribbean islands being assuredly next. Thanks very much for this review — I’ve added this to my list of must read. As a Union guy, and someone who thinks slavery is evil, I nevertheless agree with Blowhard that the Civil War was a great tragedy and we should do everything we can to learn lessons on how not to repeat such a calamity. I do think the North should have worked harder to offer the South alternatives to their “peculiar institution”, in particular, massive pay-outs and plans to resettle newly freed slaves somewhere in the West or abroad. On the other had, as Zimriel alludes to, many Southern states at the time were interested in not just consolidation of slave power but expansion. The whole wild career of the filibusters, including William Walker, is testimony to the desire of the South for more slave territory. I think the guy still to read to give you a true picture of the tragic, sweeping nature of the war is Shelby Foote — his three volumes on the war might be my favorite books of history of all time. I have all three Foote volumes and will definitely get to them one day. An interesting historical footnote is the federal government’s “compensated emancipation” plan for Delaware. In March of 1862, with the Civil War underway but more than a year before the Emancipation Proclamation, Abraham Lincoln endorsed a plan under which the federal government would buy all the slaves in the border states from their owners and give the former slaves their freedom. He chose Delaware as the prototype because it had by far the fewest slaves of any of the border states (the others being Maryland, Kentucky and Missouri) and they weren’t particularly vital to the state’s economy. Lincoln noted that buying all of Delaware’s slaves would cost the federal treasury less than what it was costing to fight a single day of the war. Congress passed a resolution in favor of the plan but never actually approved it. Before long, antislavery sentiments grew so strong that the idea of paying slaveowners became unpopular, and in 1863 the Emancipation Proclamation made the issue irrelevant. I think if Lincoln was willing to compromise, it says something. Amazes me that the 13th amendment he offered the South was to preserve slavery in slave states w no expansion. That’s going pretty far to try to avoid a horrific war. On the statues — the tribe that’s demanding this isn’t mine. But, am totally cool w anything glorifing the Confederate cause to come down. I remember being agog to see Robert E Lee in full uniform prominently standing in the basement of the capital. (With Rosa Parks looking at him from across the room). As a Union man, I did not want the Enemy in my Capitol. I suspect the gigantic 1857 Mutiny in India against the British was much on the minds of Southern slaveowners when they thought about the chance of a slave revolt. I was just browsing through Charles Mackay’s “Life and Liberty in America: Or, Sketches of a Tour in the United States and Canada 1857-8”. While in Washington, DC, he has lunch with five Congressman and the main subject of discussion during the meal is the Indian Mutiny. Being that he’s in the North, these Congressman are admiring the British efficiency in suppressing the rebellion.